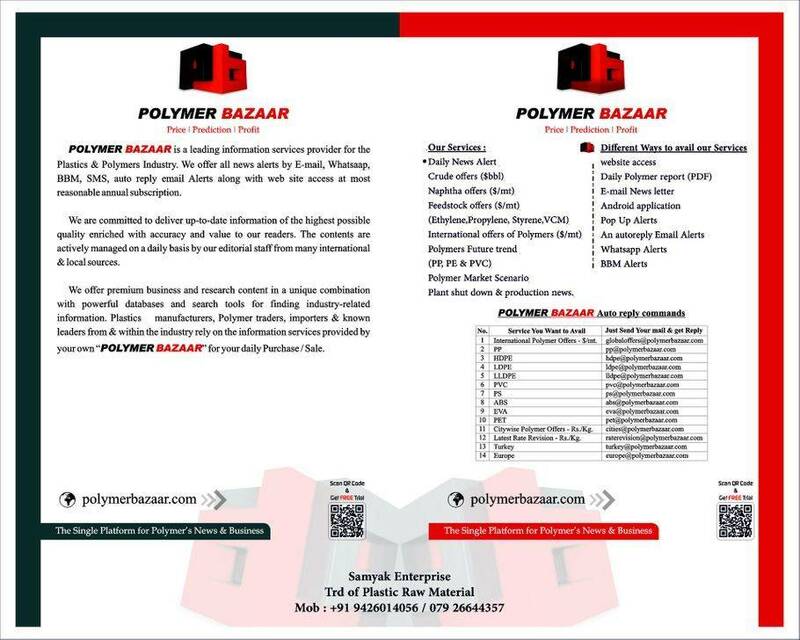 Domestic open market Polymer rate of major seven cities of India. (Ahmedabad,Mumbai.Delhi,Kolkata,Banglore,Pune & Indore) ,We are in discussion with other parties in addition to this cities. International Polymer rate in USD/mt along with converted into Rs. / kg after importing to Indian port. Purchase opinion with next expected price prediction. Aromatics ( Butadiene, Benzene, Toluene, Xylene, Methanole, etc.) offers at China Market. Feedstock offers at South East Asia. Movement in polymers which occurs during a week,with an average change in USD/MT. When ever local company will revise rate ,we will send a mail to all paid members. A paid customer is allowed to put query reg. requirement related to industry(Sale offer & purchase offers both ).After getting subscriber's mail we will float offer it to all Paid & Free members with all contact nos.provided by paid member.Interested parties will approach query sender directly. Paid members are free to give us a comment or suggestion reg. our study. If permitted by member we will forward member's study/comment/opinion to other members. As site is being surfed globally,we have designed a platform to advertise your product through a platform of our site.